Welcome to our 10,000th member! MMU’s Alumni Association has broken the 10,000 member barrier, making it one of the fastest growing in the UK. The Association, which was established in 2007 to allow graduates to stay in touch and share their successes, has exceeded its membership target three months ahead of schedule, with a total of 10,150 alumni signed up. Members range from influential business leaders, to fashion designers, actors, scientists and TV personalities, but everybody who has successfully completed a course of study at MMU is welcome to join. Membership benefits include invitations to professional networking events, extended careers and employability services and discounts at over 100 venues and shopping outlets across the UK. "We’re growing so fast," says Rachel Charnock, Alumni and Development Officer at MMU. "We are a hugely popular University, and having a strong Alumni Association can be very beneficial, not only for graduates but for current students as well, as many of our alumni are well positioned to offer work placements, bursaries and mentoring to undergraduates." The Association’s success is being recognised at the House of Commons on November 16 at an event hosted by Vice Chancellor John Brooks. The event will bring together alumni, and Government and business contacts to address the public funding cuts faced in Higher Education. 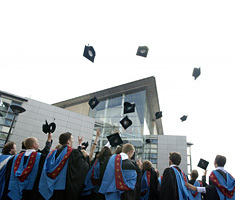 Next Story Do placements boost degree scores?